We travelled north over the break and visited some of the small towns off the main drag. En route we felt it would be remiss of us not to visit some of the large fruity offerings in Northern NSW and Southern QLD. 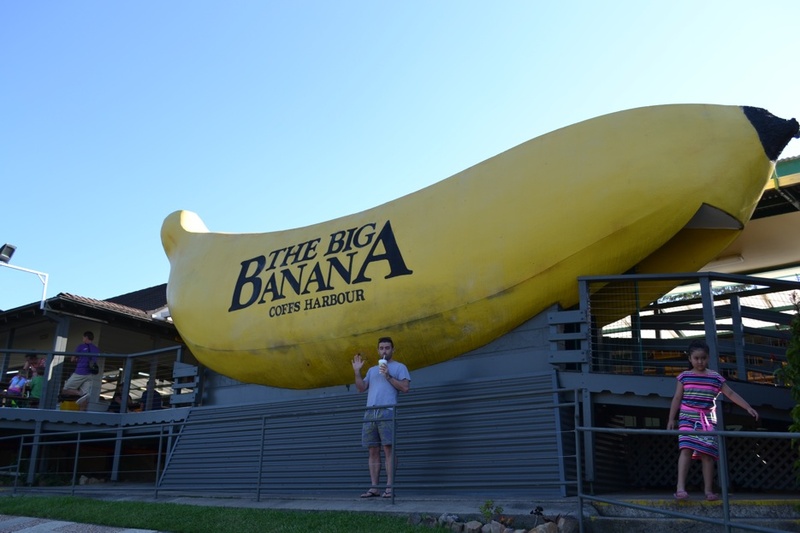 In Coffs Harbour we found that the Big Banana was going strong. The carpark was full and the cafeteria seemed busy enough. As far as big things go it isn’t very big. I would say it is punching above its weight in terms of a popularity to size ratio, but it does satisfy one of my basic criteria for big things: you can walk into it. Inside there were some monitors that probably once had some entertaining visuals pertaining to banana plantations or some such thing. They looked like they died a while ago. I’m not sure why someone hadn’t covered them up with something – if nothing else it may have concealed the slowly creeping entropy occurring there. While there was a quite a few people at the Big Banana, there were also a lot of expressions that seemed to say “am I missing something?” At the cafeteria we got a couple of the local delicacies: A Big Banana smoothie and a frozen chocolate covered banana on a stick. Both were quite good side-of-the-highway treats. Claire remarked that the banana is particularly treat-like in frozen form, and I had to agree with her. 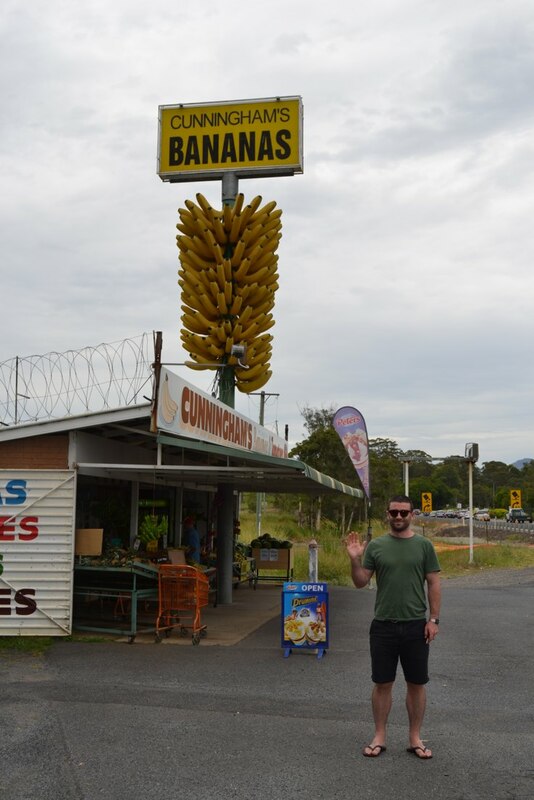 As far as photo-opportunities go, the Big Banana has a decent foreground for the touro-snap. A neat little lawn surrounded by a chain fence lies in front of the fibreglass behemoth. Between the them is a path for the photographee to stand on while the photographer stands on the other side of the lawn. They’ve clearly thought about this, which is more than can be said for the folks up at the Big Pineapple. 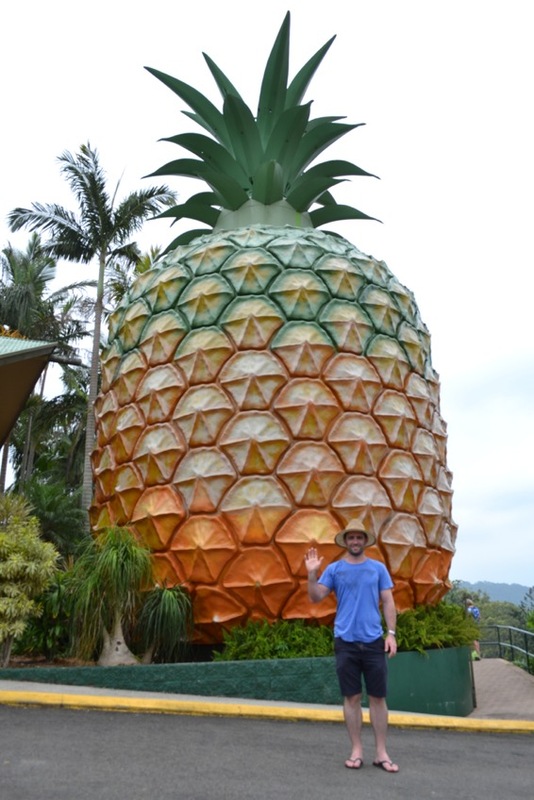 While the Big Pineapple is old, I’m not sure if there has been consideration given to the photo op for a long time. The carpark and building are right next to the Pineapple and there is no other available space around it, so unless you don’t mind a decent swathe of asphalt in your photo then this isn’t going to be a very satisfying snap. 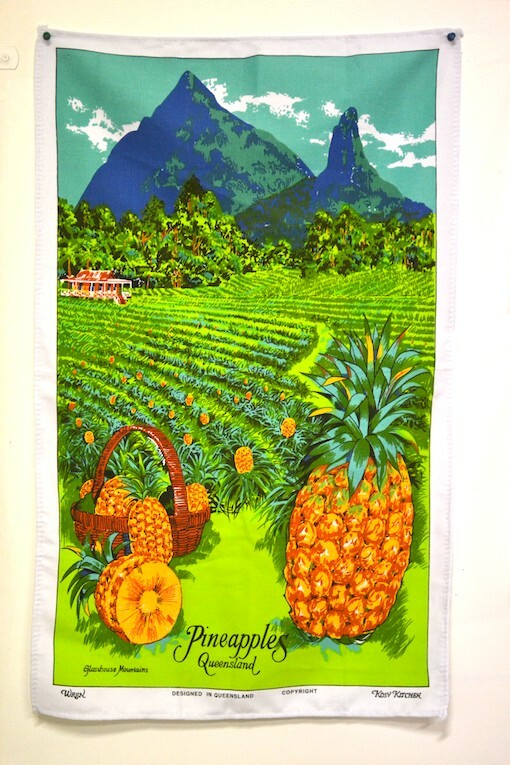 There is an old postcard of the Pineapple in the very early days sitting smack bang in the middle of a field prior to the encroachment of the bitumen (seriously, it’s like three feet from the thing). In the postcard it looks Stonhengian in stature. No structure dared enter its realm. This is what I was hoping to see when I visited the Pineapple. What I realised was that The Big Pineapple and Stonehenge were experiencing inverse trajectories in terms of their perceived aura. A friend had warned us en route that the Pineapple was “not what it used to be”. She was right. The gift store was pretty nondescript presence in a corner of the cafeteria some distance from the pineapple. This cafeteria, it should be mentioned, reminded me of Broken Hill in the sense that it had clearly once experienced boom days but now the scale and openness of the space emphasised how few people were there. Part of me loved the quiet creepiness of it. Another part of me wanted a crowd for the collective experience of big fruit and small knick-knacks. As with many still life pictures (of fruits and breads etc.) with a rural landscape in the background, the fruit in the foreground of the picture can sometimes appear to be an enormous piece of fruit in the background landscape. My theory is that it is this type of picture which influenced the pioneers of big fruity attractions. An enormous thing in a field. The strangest of our big things visits was the Big Prawn in Ballina. From the highway we marvelled at the gigantic crustacean rising above all else and consequently missed the turnoff. The Big Prawn is another one of these sadly bypassed big things and we drove on for what seemed like an eternity before getting the opportunity to turn around. I should say that I consider the Big Prawn to be in the category of big fruit because as the French say, seafood is ‘fruits de mer’. Fruit of the Sea! Oui oui! There’s no turnoff sign to the big sea fruit, and that isn’t where the dearth of signage ends. There are simply no signs anywhere on or around the Big Prawn. It is next to a Bunnings carpark, or rather on the edge of one (and only just – it is in the exit/entry). If the Big Pineapple was bereft of photo opportunities then the Big Prawn seemed to be actively discouraging photographs altogether. It was dangerous stuff trying to avoid cars driving at pace towards the Big Hardware Store. It is an impressive structure (the prawn), and looks fairly anatomically correct, but there is absolutely nothing to explain itself or its genesis to the world. Like a stubborn artist it seems to be saying “interpret this as you wish” or “project upon me your own meanings”. We couldn’t figure it out. In fact we felt slightly embarrassed having our photo taken beside it because, despite its scale, nobody else seemed to notice it was there. An arrogant big fruit is the Big Prawn. You couldn’t even walk inside it. As disappointing as a lack of explanation was it did provide us with a unique big fruit experience. What a strange thing it was. There were any number of explanations. All I can say is that in this nouveau world of food vans there is definitely an opportunity for a shrimp stand underneath it. 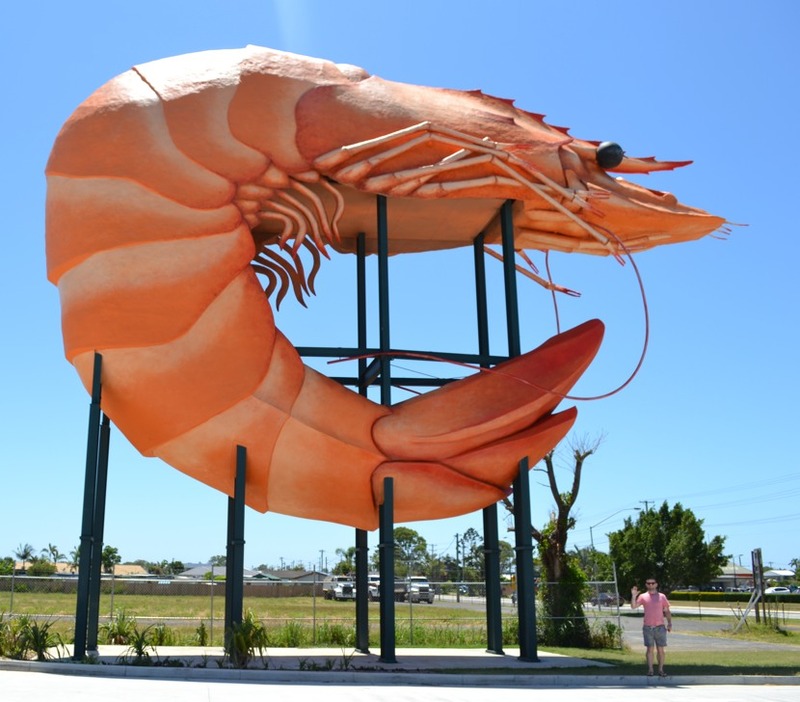 Ballina’s newest attraction the BIG PRAWN is another of Australia’s iconic big things. Built in 1989 the Big Prawn has undergone a make over and was reopened in July 2013 including a tail. It is situated adjacent to the hardware warehouse Bunnings on River Street, Ballina the crustacean is available for public viewing (and photo’s) at all hours of the day and night. Come see another of Australia’s big things and while here grab your own fresh catch from one of the seafood stores on the opposite side of the road. not a designated attraction but an impressive sign nonetheless.